11/29/18: VERY IMPORTANT NOTICE! Please DO NOT make your hotel reservations now, even though we know how much you want to do it. :-) Final details are not yet all worked out and we don't want your reservations messed up (nor, we're sure, do you!). It's also not fair to the other Region 13 members who are awaiting the go-ahead on reserving rooms. ​Reservations will go live on December 8. Thank you for your cooperation. 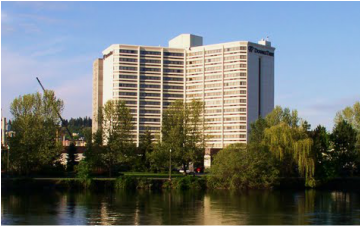 ​For 2019, we will be housed at two hotels: DoubleTree Hotel Spokane Falls (Headquarters) and the newly acquired and remodeled, The Centennial. More information about each hotel is below. When housing registration opens, we will post that information here.